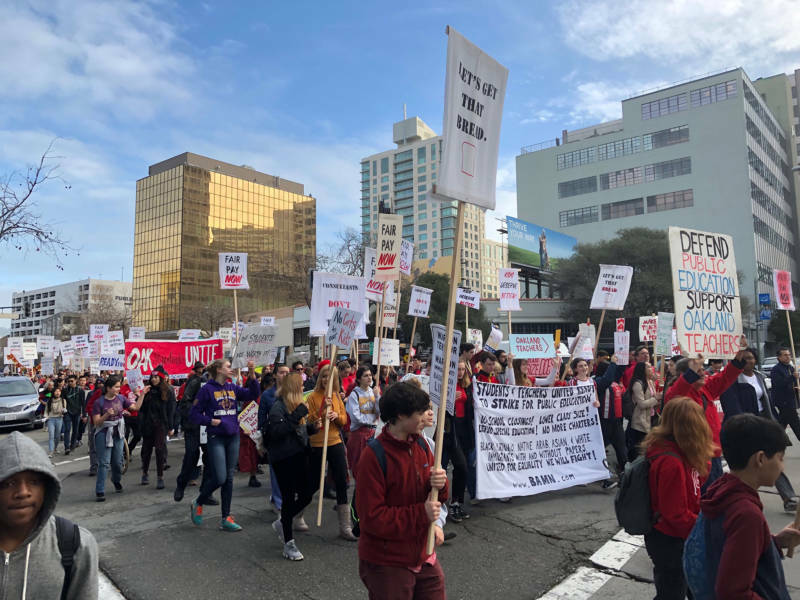 Hundreds of Oakland teachers, students and supporters, frustrated over an impasse in contract negotiations with the school district, gathered outside Oakland Technical High School Friday morning and then marched in a wildcat walkout, unauthorized by the union, to show the district they're willing to strike. It's the second time in two months some teachers called in sick en masse in what they're calling a sickout. 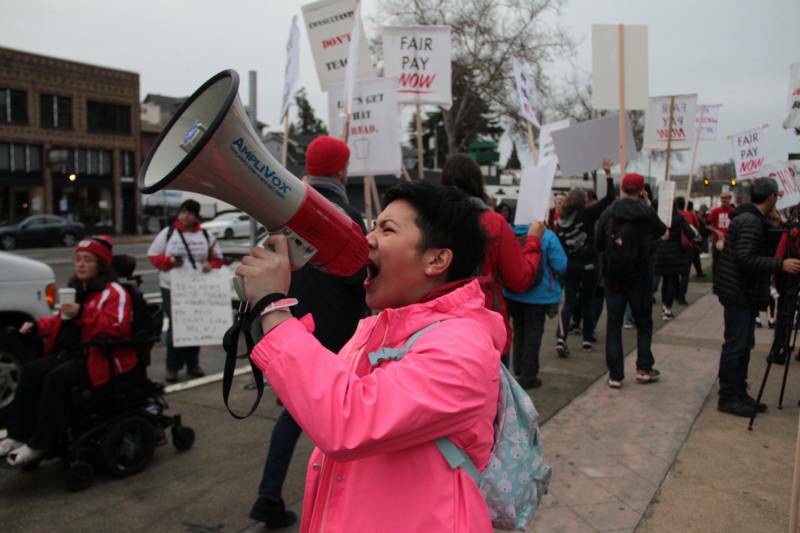 Oakland teachers have been without a contract for more than a year and a half, and negotiations with the Oakland Unified School District have snagged on issues like teacher pay and class size, among other things. 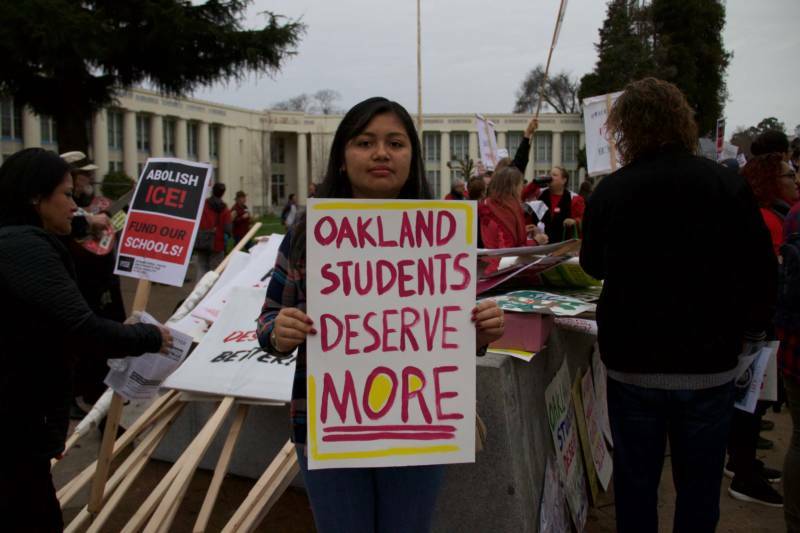 The Oakland Education Association wants to see a 12 percent salary increase over three years, while the district’s latest offer is a 5 percent increase over three years. 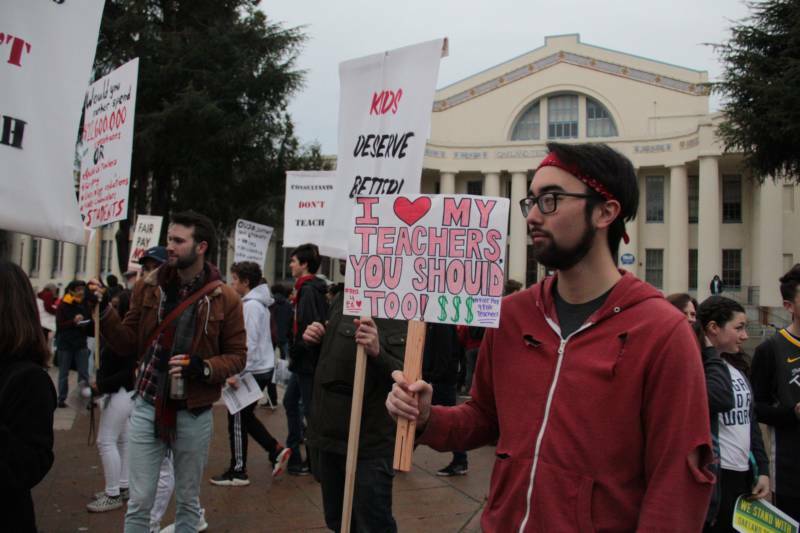 Demonstrators carried signs Friday morning that said "Ready to Strike," "Fair Pay Now," "Kids Deserve Better" and "Honk if You Hella Love Oakland Teachers." Drivers showed their support with blaring horns as they passed by. Oakland police escorted the demonstrators as they marched to district headquarters in downtown Oakland. "I’m really out here more for the students, not for myself," said McClymonds High School teacher Booker Lett. "If it was left up to me, I’d be in class teaching now, and I told them that yesterday, but I also told them this: For every strong democracy, there has to be a strong union." Jamie Treacy, a Skyline High School visual arts teacher, said he was fighting for the wages of new teachers. “I’m really thinking about the teachers who can’t be out here today because they’re worried about their job. I’m tenured,” Treacy said. He's also concerned about class sizes and said his largest has 37 students. Skyline High School counselor Dylan Ohara carried a sign made for him by his students. He said he's out calling for pay to match the cost of living in the Bay Area. Ohara also pointed to a 25 percent turnover rate in the number of teachers who don’t come back for a second year. "How can we give children the support they need if we can’t build ourselves professionally?" Ohara said. Ceramics teacher Donna Salonga said she used to live in Oakland but moved in with her parents in San Francisco because she was paying more than half of her salary in rent. Salonga, teaching in her third year at Skyline High School, said she'd like to stay at the school. "I’d love to live in Oakland, to live in the community that I work in and teach in,” she said. Cristopher Bautista, a ninth-grade English and history teacher at Oakland Tech, said he works a second job at Starbucks 15 hours each weekend. Bautista said he's been a teacher for five years, but this is his first year teaching in Oakland. "A lot of my teacher friends love their work in Oakland, but financially they can’t do it,” he said. Many high school students attended the rally with the support of their parents, who called them in as sick. 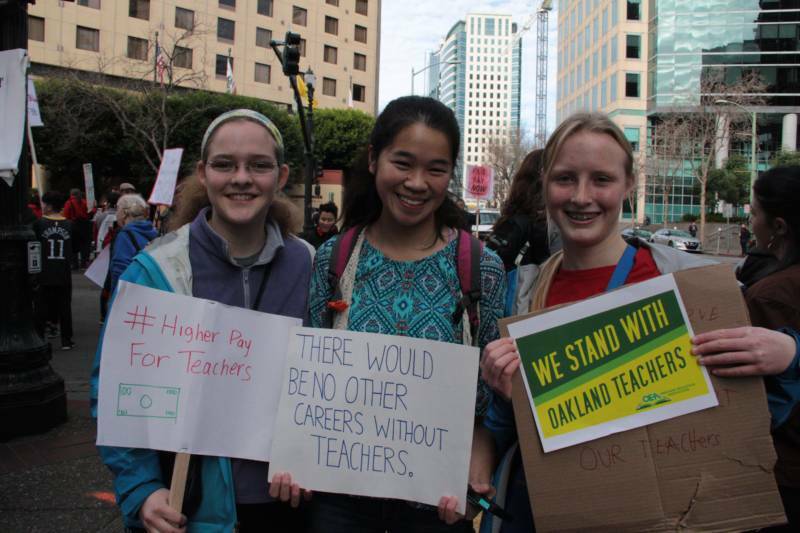 "We understand that our teachers are really struggling to pay their rent," said Josie Goodson, a 9th grader at Oakland Tech. "We're here to support them." In a letter to staff sent this week, district officials reminded teachers the Friday action is illegal, writing: "Teachers participating in sick-outs will be subject to disciplinary action and will lose pay for time missed as these coordinated actions present significant safety and instructional problems for our students." 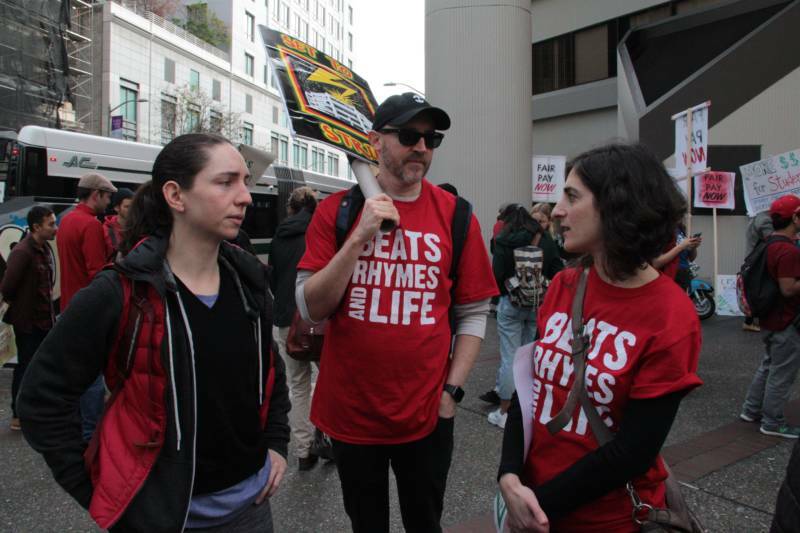 Friday's sickout comes after a rally last weekend drew hundreds of teachers, parents and labor leaders to downtown Oakland to call for increased funding for education and to protest looming budget cuts and school closures. This sickout, like the last, isn't sanctioned by the teachers union. The showdown over pay and working conditions is playing out as budget cuts and school closures roil the district. Oakland Unified is faced with tens of millions of dollars in cuts over the next three years, and bailout money available from the state hinges on the district showing that it’s taking steps to become financially stable. For their part, district officials say they want to pay teachers more. It has identified boosting teacher pay and settling the contract as priorities for improving teacher retention and ultimately improving student outcomes. KQED’s Julia McEvoy and Vanessa Rancaño contributed to this report.